I made this khichri quickly in a pressure cooker. 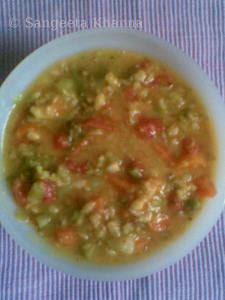 Dunked 1/4 cup of soaked barley, 1 tbsp of whole green mung , 1 tbsp of masoor daal, chopped veggies....french beans, broccoli, carrots, tomatoes and onions almost 1/4 cup each. Everything goes into the cooker along with salt and turmeric powder and boiled up to one whistle. A tadka to do after it cools down. Just heat a tsp of ghee with a small pinch of asafoetida, a tsp of cumin seeds and 2 cloves of garlic chopped.....till the garlic turns pink...........remove from heat,add half a tsp of red chilly powder, wait for a moment till the chilly gets mixed up. 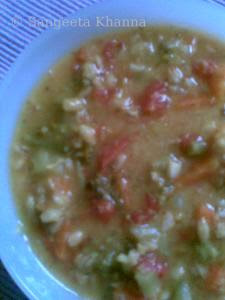 barley for diabetics healthy breakfast healthy meals khichri/rice made healthy multigrain/wholegrain soups for the wt. conscious these foods helped me loose wt. I love khichadi, adding barley makes it even more healthier.. I don't have barley will omit that and make this. How do you get such wonderful ideas.!! How do u get such wonderful idea.. amazing!! Thanks for sharing!! Mmm unique idea! Looks yummy! @SJ...it can be made with daliya or brown rice for an equally healthy alternative....hope you know now what is daliya. @ viki...dear i usually have it for breakfast...sounds unusual but that is the only meal i eat alone so it's easier to eat this kind of stuff if you like to have it daily...my husband usually likes sweet things for breakfast n i like savory....moreover when we take lunch n dinner together we eat similar things then. Flavor amazing ! Healthy very tasty .